Gemini Mini Llamas is located in Hastings, Minnesota. We have 10 beautiful acres for our llamas to wander! We are adding fencing & converting an old hog house into a llama barn. We also have an old traditional style barn that we hope to renovate over time. Please come visit us! A miniature llama, what’s that? (Yes, I hear this often.) They are just as beautiful as a standard size llama, but in a smaller package! Their size makes them unique. They are a more manageable animal; both easier to care for and less feed/acreage is required. Shows are increasing in popularity, as more and more hobby farm owners are discovering the excitement of owning minis!! There are 3 categories of Miniature Llama that are eligible for registration into the American Miniature Llama Association (AMLA). 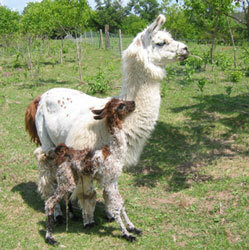 Crias or llamas under age 3, can be registered as immature status if they come from a mini sire and dam. At 3 years of age, llamas measuring 38 inches or less at the withers, can be registered as mature minis. Females that stand 38-40 inches at age 3, can be registered as foundation females and are very useful for breeding minis, but cannot be shown in mini classes. As of November 2007, there are 659 minis in Canada & the US: 125 foundations females, 195 immature and 340 mature minis! Shearing is done in the early spring, as it gets so warm for them that it must be removed to keep them comfortable in the summer heat. This fleece makes great roving or yarn. 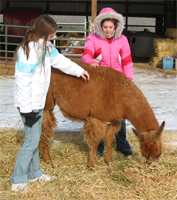 Both llamas and alpacas (related cousins) have fleece that is warmer than wool. Also, it has no oil or lanolin, making it less apt to cause allergies or itchiness. Some llama fleece has guard hair in it, which should be removed prior to processing the fiber. Current day llama owners are working to breed these guard hairs out of the fiber. Some animals are now found to be "single-coated," meaning guard-hair free. 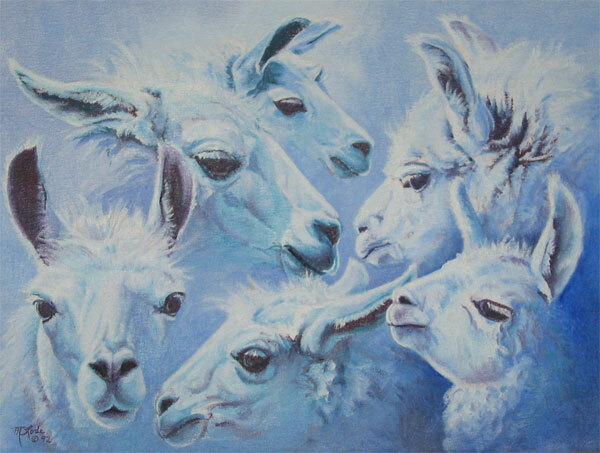 This llama collage was painted by my talented artist cousin, Dolly Lode, from Montana. Her mother, my Aunt Mary, has raised llamas for over 20 years on the family ranch in the foothills of the Little Belt Mountains. This is the original ranch that was purchased from homesteaders by my maternal grandparents a century ago. In addition to llamas, they continue to raise both sheep and cattle.